← Where’s Waldo (er, I mean RBG)? Be patient with the following video tweet. She doesn’t start talking for almost a minute. Saikat Chakrabarti was Executive Director of Justice Democrats. Their slogan is #OURTIME, It’s time to usher in a new generation of diverse working class leaders into the Democratic Party. A Democratic Party that fights for its voters, not just corporate donors. Justice Democrats recruited Alexandria Ocasio-Cortez, or AOC for short. I guess somebody has to have brains, but I hope her mouth continues to be engaged without the brain engaged. 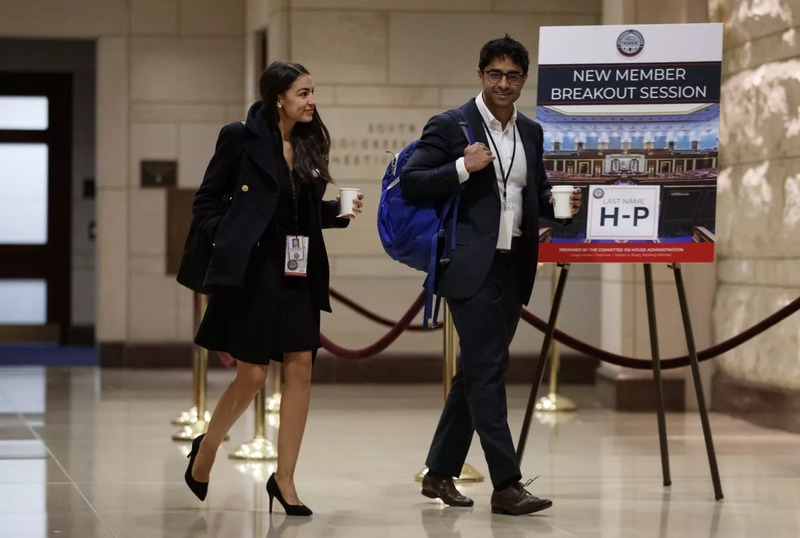 Now Ocasio-Cortez is headed to Congress, with Chakrabarti as chief of staff. This entry was posted in AOC, Current Events, Government, Politics, Uncategorized. Bookmark the permalink. I’ve always wondered how they make the “Dummy” talk without moving their own lips. I’m glad to know there are some brains somewhere. So she really is being used. They really (really) wanted people who would do what they “think” she should do. Although her own bull is evident too. Oh, I think she’s a very willing participant. Ocasio is a puppet in the same vein as Obama. Both are dumb, pliable, ignorant, attention whores and they both have egos bigger than the Empire State Building yet both are attractive to a certain segment of society that the MSM and the Oligarchs of DC have been grooming for decades. The difference is that Obama was more party ‘traditional’. AOC and her buddies are more Bernie lefties and they won’t be easy to control by the Schumer and Pelosi group. Sort of like President Trump can’t be controlled by McConnell. Because her faction is out to replace Schumer and Pelosi. The Old Line Rat pols now have a 5th column inside their ranks to deal with. I had a thought today. I wonder if Pelosi is letting AOC and her compatriots do whatever they want until they crash and burn. I could be totally wrong, but she doesn’t seem to be trying to reel them in right now. I tried to watch it but really couldn’t get past the first 30 seconds. The first or the second video (the first is in the tweet)? The first one is important to watch. The second one you can skip, or just watch the very beginning. Ah! I just saw that there is a video in the twitter link. I have a new ad blocker and some tweets don’t show me picture or videos I only see words. I’ll have a peek in a little bit. It is the second video I started to watch. No wonder there is such a divide between Ocasio’s Twitter persona and her real life person. I saw Saikat Chakrabarti the night that Ocasio won (or maybe the next day) and he immediately made enough of an impression on me in a 15 second sound bite that I knew who she was talking about as soon as Maghdalen Rose mentioned his name. Rose sounds spot on. And it ties everything about Ocasio together. Notice you never see any of Ocasio’s co-workers interviewed by the MSM. Apparently she was not well liked. Commie Chick had a “news conference” today together with the two Sharia FGM babes and a seriously overfed illegal “dreamer.” There were 18-20 in the “news conference” read protest. There were no brains whatsoever in evidence, just a whole bunch of loud mouthy harpies. Being female and a member of a proven victim group I can say that, so no lectures, please (the visually-challenged hearing-enhanced id10t-allergic victim group). Stella, you sure there is a brain anywhere? Anyone with half a brain would have kept Commie Chick well-hidden. And her little dog Toto, too. I’m betting the AOC group and the Sharia group are both riding the tiger and at some point someone’s gonna eat someone, this is a marriage of convenience. Woof! TWO fatal stabbings in two days in NOLA – Walmart must be outta ammo.